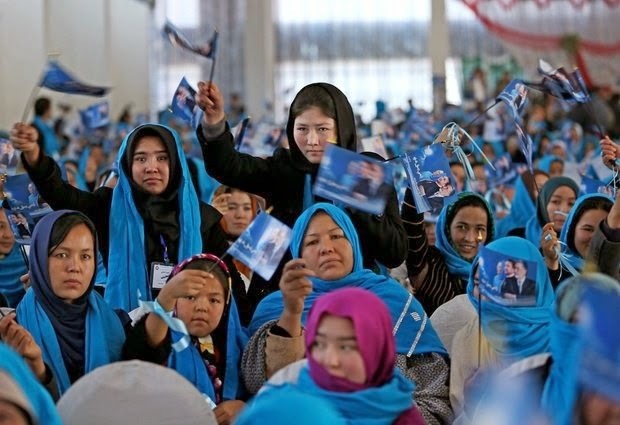 Female supporters of Afghan vice presidential candidate, Habiba Sarabi and Afghan presidential candidate Zalmai Rassoul hold flags with his photo and two vice presidential candidate's during a campaign rally in Kabul, Afghanistan. The Afghan vice presidential candidate strode down the aisle separating hundreds of male and female supporters at a campaign rally in Kabul. She shook hands with the women filling the chairs to her right. To the men on the other side, she simply nodded. Writing on the flags reads, "vote for Zalmai Rassoul." KABUL, AFGHANISTAN (AP) — The candidate strode down the aisle separating hundreds of male and female supporters at a campaign rally in Kabul. She shook hands with the women filling the chairs to her right. To the men on the other side, she simply nodded. Habiba Sarabi is the most prominent woman running on a ticket in the April 5 election to choose a successor to President Hamid Karzai. Sarabi once served as Afghanistan's first female governor, and her current bid to become Afghanistan's first female vice president is part of an effort to get out the women's vote as candidates scramble for every ballot. Women "can affect the transition, the political transition," she said in an interview after addressing the rally to support Sarabi and her running mate, presidential candidate Zalmai Rassoul. The event was held in a wedding hall in a Kabul district dominated by her ethnic minority Hazara community. But Sarabi, a 57-year-old former governor of Bamiyan province, still must conform to cultural norms in this deeply conservative Islamic society. Her challenge highlights the difficulties facing Afghan women who worry about losing hard-won gains as international combat forces prepare to withdraw from the country by the end of this year. Afghan women were granted the right to vote in the constitution adopted after the U.S.-led coalition toppled the Taliban regime in late 2001. Under the Taliban, women were also banned from school and forced to wear the all-encompassing burqa. But security concerns have marred their participation in previous elections. In areas of the country still controlled by the Taliban, women have been threatened with violence if they vote. In 2009, many Afghan women registered but then gave their voting cards to male relatives, who ended up casting multiple ballots as polling officials and police conveniently looked away — one of many forms of fraud that tarnished Karzai's re-election. Although voting cards are supposed to include a photo for identification, in some areas women refused to be photographed. Naheed Farid, a lawmaker from the western province of Herat, predicted fraud will be rampant this year as well. "I am so optimistic that we will have more women to vote in this election, but who they vote for and what happens to their vote will be a problem," she said in a telephone interview. "There's lack of awareness that women can decide on their own, and families especially the fathers have an influence, and this is something we can't change now, not this time." Still, she and others said, there are signs of progress. There are nine candidates in the crowded race, but only three are considered front-runners — Rassoul; Abdullah Abdullah, who was runner-up to Karzai in the disputed 2009 election; and Ashraf Ghani Ahmadzai. Gul Makai Safi, the head of the women's council for Abdullah's campaign, said women are streaming into their offices to learn about the process. She expressed concern that women in areas where militants are active will be unable to vote. "We are very hopeful and optimistic that this time the women's vote will decide the fate of the candidates in the election," she said. "Women will bring a change in the result of the election this time." Ahmadzai's wife, Rula, has even stumped for votes at campaign events, something that is very rare in a country where the current first lady has almost never appeared in public. There are officially 12 million eligible voters in Afghanistan, according to the Independent Election Commission, but the number of people who go to the polls may be higher because many voter cards were issued in past elections and are unaccounted for. Since registration began last year for next month's election, the commission has document 3.6 million new voters, including 1.2 million women. Volunteers have visited villages and districts around the country to inform women about the issues and how their participation could help improve their lives. But many obstacles remain. To help prevent suicide bombings and other attacks, police will search voters before they are allowed to enter the polling stations. The Interior Ministry said it is training 13,000 women to search female voters, but there is concern there will be too few of them — and that some women will be turned away from the polls as a result. And even in Kabul, some women have no idea how to register. "No one guided us and we haven't got voting cards now. If we could get our voting cards, we could have fulfilled our part in making the government," said Gul Sara, a woman living in an internal refugee camp in the Afghan capital. Activists also warned the situation has not changed in areas where the Taliban remain active and conservative mores are entrenched, including many parts of the east and in the southern provinces of Kandahar and Helmand. Covered from head to toe in a black veil in downtown Kandahar city, Shaqiba Ahmadi acknowledged the difficulties facing women and chastised the government for not doing more on their behalf. "I think we have to try harder," the 20-year-old tailor said. "Afghan women are not very active. They should vote. I will vote." The hall in Kabul where vice presidential candidate Sarabi gave her address was packed equally with men and women, though they sat on separate sides of the room. Sitting at the rally with a turquoise campaign scarf draped over her head, Gul Chaman said she plans to vote for the first time. "I didn't care in the last election and I couldn't figure out how to get a voting card," said Chaman, who has nine grandchildren. "I hope the election will bring security, reconstruction and prosperity and stability to Afghanistan." Associated Press writer Kathy Gannon in Kandahar contributed to this report.